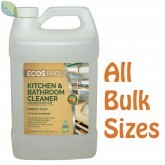 Earth Friendly Products Parsley Plus All Surface Cleaner cleans and deodorizes using non-toxic & sustainable ingredients! Parsley Plus All Surface Cleaner is a Natural All Surface Cleaner that works great for cleaning most all water safe surfaces, and excels at removing scum and grease too! This Natural All Purpose Cleaner is Great for use on most all surfaces in kitchens and bathrooms, including toilets, tubs, tiles, sinks and ovens. Earth Friendly Products Parsley Plus All Surface Cleaner can also be used on natural, glossy stones such as granite and marble, without leaving a haze or residue. The Natural, readily biodegradable, non-toxic formula is pH balanced & made entirely from plant-based ingredients. Parsley Plus All Surface Cleaner is also free of synthetic perfumes and dyes, is greywater and septic safe and is Recognized by the EPA's DfE and USDA’s Biopreferred Program. Unlike other Natural All Purpose Cleaners, which can leave toxic-residues, as Earth Friendly Products Parsley Plus Natural All Purpose Cleaner leaves surfaces safe and residue free. Parsley Plus is Safe if oversprayed on grass and plants. Natural Cleaning of Kitchen and Bathroom Countertops, Ovens & Stoves, Sink Basins, Wood and Ceramic Tile Floors & Walls, Clothing, Water Safe Painted Surfaces, Vinyl & Linoleum Flooring, Metal & Porcelain surfaces, Grills, Decks & even Outdoor Furniture. Parsley Plus can even be used as a Natural Spot & Stain Remover to remove the following items: Chewing Gum, Adhesives, Tar, Asphalt, Oil, Lipstick, Crayon, Pencil, Wax, Tree Sap, Fresh Paint and even Creosote.